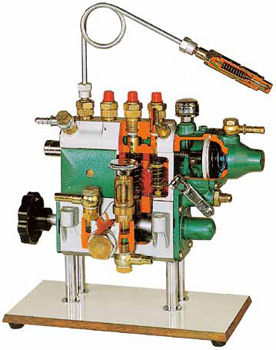 Accurate section of a pump suitable for medium displacement engine (FIAT, Mercedes) with pneumatic speed governor (rock rod or acceleration rod controlled by a diaphragm connected to the suction collector). It is provided with a feeding pump. This cutaway model is carefully sectioned for training purposes, professionally painted with different colours to better differentiate the various parts, cross-sections, lubricating circuits and fuel system. Many parts have been chromium-plated and galvanized for a longer life.